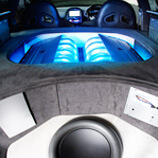 Our reputation in custom installations is renowned throughout the UK and our experience in building sound-off and show winning vehicles has been built over many years of custom and bespoke installations. We have the ability to custom build practically anything for any vehicle from various materials such as fibre glass, MDF and Perspex. We can then trim the built panels in various materials such as leather, vinyl, alcantara or perhaps for that extra special finish custom painted. Our system design and custom installation service go hand in hand to bring you a second to none service from day one of your custom installation. Custom install prices would normally be worked out on a face to face meeting as everything we build we like to be unique, but as a guide our custom boot builds and full installs start from £700 upwards. SOURCE….where ‘Mild to Wild Creations’ become Reality.